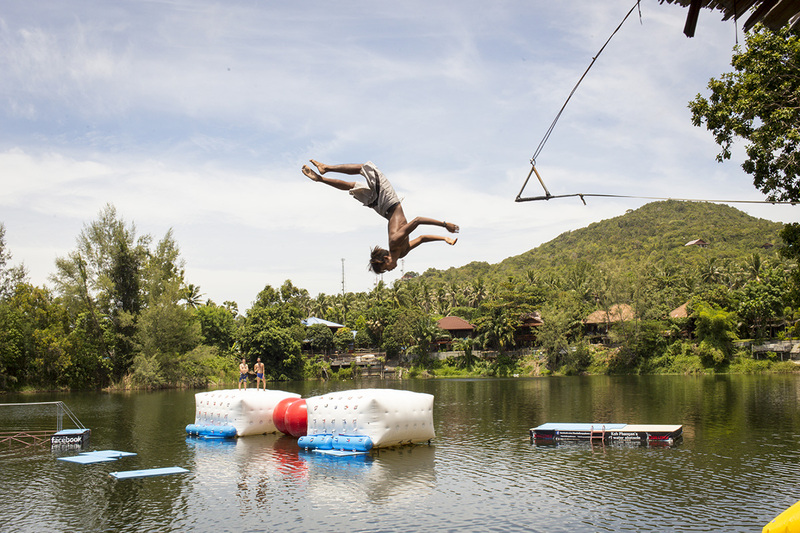 An exciting water obstacle course, The Challenge Phangan allows you to test your skills and have loads of fun. You'll find rope swings and stepping stones there, as well as monkey bars, climbing mountains, balance beams, rolling barrels, and more. After a heart-pumping workout on the course, take a break at the restaurant, which offers a delicious menu and cocktail happy hour every day. Visit the website for details and booking options and instructions. To visit The Challenge Phangan and get the most from your holiday in Ko Pha Ngan, create itinerary details personal to you using our Ko Pha Ngan day trip planning site . In the morning we wake up loaded to go get 2 laughs in this playground ... Control day and time to ensure that you have open. 30 minutes, we arrive there before and a guy inside tells us it is closed forever:-((((. Really amazing the day out here was ! Everyone was so nice and dedicated like it was their first day at the job all but the English guy behind the middle bar.. racist comments and miserable as.. like he didn't want to be there or didn't want it to be busy ..also the same guy.. when someone got hurt on the air jump they signalled to say where not alright but he couldn't be bothered to jump in So just turned around. ***UPDATE I am actually white.. he wasn't racist to me he made a comment about "they are all the same" referring to the Indians not listening... didn't bother me .. and he 100% didn't jump in when someone signalled they were not okay. The thai guys there were amazing we enjoyed just watching there enthusiasm and the fun they were having! I'm guessing that's because it's a really good place to work !.. I'll change my review to 5 star for the response I would recommend everyone to go here we have already sent at least 10 people ! The staff does their very best to make it as safe as possible and it's nice you can relax and chill there for the whole day! Great day out. 500 baht for the day. Came away tired and battered and bruised. That's the fun of it! Highly recommend. The challenge is an amazing place to go. Such a fun day out if you like activities and climbing obsticles. Quite pricy but they take photos of you and have a time challenge too. Amazing course but there are some bigger ones in chaing mai. Every day, we help thousands of travelers plan great vacations. Here are some tips on how to use your Listing Page to attract more travelers to your business - The Challenge Phangan. Promote your permanent link - https://www.inspirock.com/thailand/ko-pha-ngan/the-challenge-phangan-a1121607753 - on your website, your blog, and social media. When a traveler builds a plan from this page, the itinerary automatically includes The Challenge Phangan. This is a great way for travelers looking for a great vacation in your city or country to also experience The Challenge Phangan. Promoting your link also lets your audience know that you are featured on a rapidly growing travel site. In addition, the more this page is used, the more we will promote The Challenge Phangan to other Inspirock users. For best results, use the customized Trip Planning Widget for The Challenge Phangan on your website. It has all the advantages mentioned above, plus users to your site can conveniently access it directly on your site. Visitors to your site will appreciate you offering them help with planning their vacation. Setting this up takes just a few minutes - Click here for instructions.